This entry was posted on February 17, 2010 at 12:51 PM and is filed under comfort food, food foraging, restaurant food. You can follow any responses to this entry through the RSS 2.0 feed. You can leave a response, or trackback from your own site. Can’t wait to try this recipe, Sarah! Especially with my new vegetarian aspirations, mushrooms are a savory substitute! 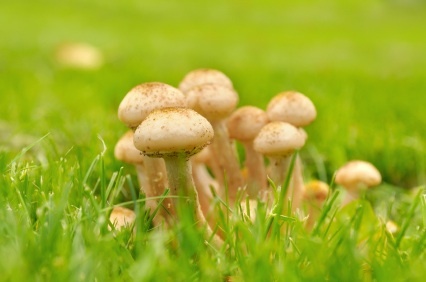 Mushrooms are my very favorite food. I love them in anything. Can’t get enough of them. Except, now that I read about mushroom ice cream, I’m not so sure…it’s really good, huh? Who wudda thought?!! It’s only recently that I’ve come to truly adore mushrooms! I’ve heard they give hunting tours in Central Park and I’d love to try it out. Well, friend, I’m down in So. Cal. this week and had the pleasure to visit the Santa Monica farmers’ market for the first time on Wednesday. One of the purveyors was selling chanterelles that were — I kid you not — as big as soccer balls. You could have made a bathtub’s worth of chanterelle pate with those. What a great post! When I lived in France, a friend made a mushroom three-course meal for me, with mushrooms she had found herself in the nearby forest, but never had I heard of mushroom ice cream. Anne — Glad to add to your repertoire. Sheryl & Alexandra — Yep, honestly, mushroom ice cream can be wonderful. Almost Slowfood — Gleaning in Central Park. Love it! 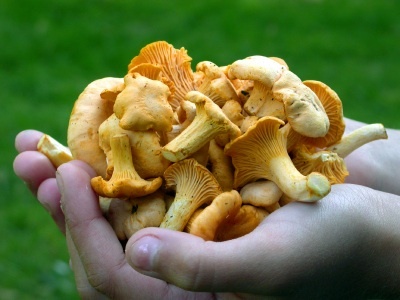 Cheryl — Chanterelles as big as soccer balls? I’m suitably impressed. What do you think they’re feeding ’em in LALAland? We’ve gone hunting for chanterelles once and loved it. Such a nice activity, and the mushrooms were pretty yummy too! The only problem was we were terrible at it. Luckily we were with friends who found them as if by magic!